Endangered Tales of the Philippines promises to be a spectacular showcase of the country's extraordinary wildlife. People can also visit the organization's photo exhibit, which will run from April 15 - 22. 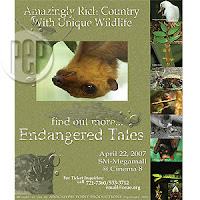 The photos of the endangered animals taken by the CEAE will be displayed in front of Cinema 8 of SM Megamall. As we celebrate Earth Day on April 22, the Center for Environmental Awareness and Education (CEAE) will be screening a film that showcases one of the world's biodiversity hotspots—the Philippines. Endangered Tales of the Philippines shows why this archipelago is one of the most biologically rich places on the planet. This 58-minute film features unique footage from over 15 expeditions and eye-opening interviews with over 30 biologists, scientists, and conservationists—all of whom highlight the urgent need for conservation efforts. For one day only, moviegoers will be able to watch a riveting showcase of mammals, birds, reptiles and amphibians, most of which are endemic—or those found only in the Philippines. The film will be screened at SM Megamall Cinema 8 from 10 a.m. to 8 p.m. The CEAE produced this comprehensive documentary on the country's extraordinary wildlife in an effort to get people excited about the diversity of species in their own country. Endangered Tales of the Philippines celebrates the beauty of the Philippines and contrasts this with the fragile state of the environment. Over ten months of unique footage on Philippine wildlife has been woven into a powerful documentary on the beauty and fragility of the country's natural heritage. Founded in 1999, the CEAE is a leader in environmental education and environmental awareness initiatives in the Philippines. The organization has spearheaded a variety of projects such as Moonrise Film Festival, the first environmental film festival in the Philippines. CEAE constantly produces and distributes new content such as the award-winning documentary Children of the Mountains, which won the Mark Hasslem Planet in Focus award. Tickets are available at the venue or call CEAE at 721-7360. Or visit the CEAE office located at Unit 3A, Gilmore Heights, Gilmore, Quezon City. i wonder if they'll show that film here in the states. thanks for the info on the ceae. This sounds like such a wonderful film! I love when they showcase endagered animals to get the word out. Hopefully it will be affective. hope this will be successful. i have a soft spot for nature, you know.